Hello! 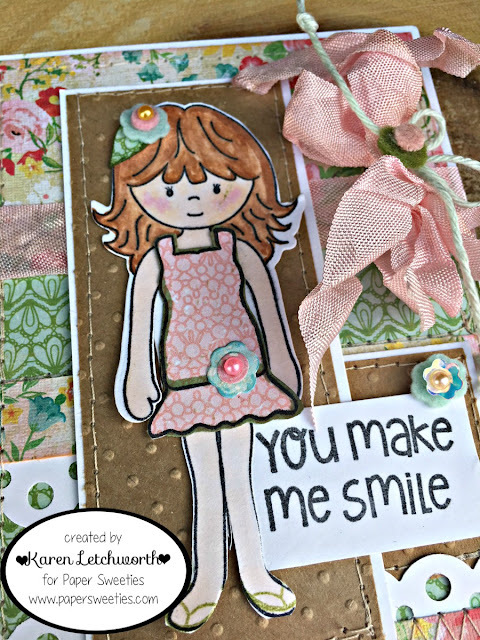 Madison and I would like to welcome you today as I share a sweet card I made for Paper Sweeties by dressing Madison in a cute little sun dress from the At The Beach Stamp Set. I stamped her dress on pink patterned paper and cut it out. I also stamped Madison and I colored her with my Copics. Once I had her dressed, I cut some flowers from wool felt and patterned paper using some flower dies found in the Basket Add Ons: Hoppy Easter Stamp Set to adorn Madison's hair, clothes and such. The stamped sentiment is from the Hugs & Kisses Stamp Set. I layered some patterned papers to create my base, and machine stitched the edges. 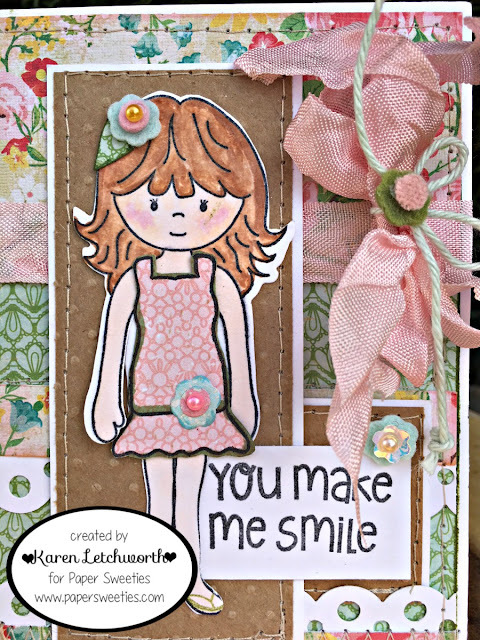 I ran the kraft paper through my Sizzix with the Swiss Dots Embossing Folder to create a texturized backdrop for sweet Madison. I ran a width of Bubble Gum Seam Binding across my card and also tied a double bow with it, and topped the bow with some Solid Mint Baker's Twine and a wool felt flower that was cut using the flower cuts found in the Basket Add Ons: Hoppy Easter Sweet Cuts. Cute, cute, cute...that's what you'll find at Paper Sweeties. 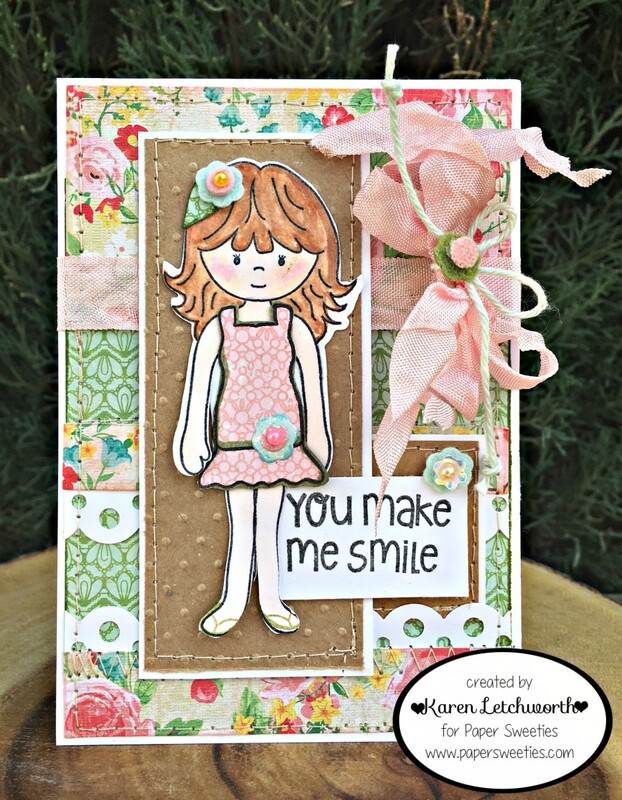 There are so many FABULOUS stamps, sweet cuts (dies), and embellishments available at Paper Sweeties, and they all work so well together. I love to add Paper Sweeties ADORABLE flower-shaped Sequins to my cards; and on this card, you will see a Sugar Sprinkles Sequin. They're unique, sweet, affordable, and they come in several pretty colors. They're just OH, so sweet! All of my friends at Paper Sweeties have prepared something special for you today. Here's the list of their names with links to their projects. Just click on their name, and you will be taken directly to each of these sweet blogs to see these designers' amazing Paper Sweeties projects today. We sure hope you're inspired to purchase something new from Paper Sweeties; and we know you will LOVE your new goodies! Enjoy your day, and create something beautiful! Paper Sweeties can help. 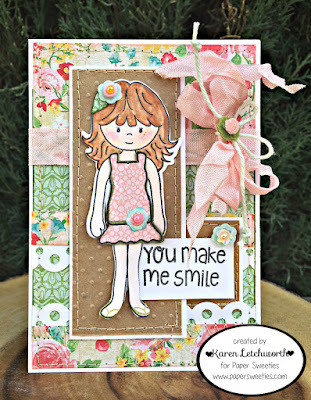 Simon Says Stamp Wednesday Challenge Blog - Simon Says "Add A Die Cut" so I used my Paper Sweeties dies on this card (Madison Sweet Cut details above). Very lovely card with sweet Madison, Karen! Love the patterned papers, stitching, and wonderful bow treatment! Happy Valentine’s Day!! Karen, so sweet, great papers and ribbon. So pretty! Love the background paper -- so spring looking and cheerful! Thanks so much for linking up to the Cropstop blog this month! Thank you for joining us at Simon Says Stamp Wednesday Challenge this week.